We will continue from where we left off last time: looking at possibilities for creating a digital toolkit for groups like Pixelache. Last time we agreed that we should use open source software wherever possible, and we began working out what kinds of tools we might need. We discussed the benefits of Trello as a simple project organising tool and then looked at various open source alternatives. Tonight we will look at >WeKan, an open source software that bills itself as "The open-source <em>Trello-like</em> kanban". 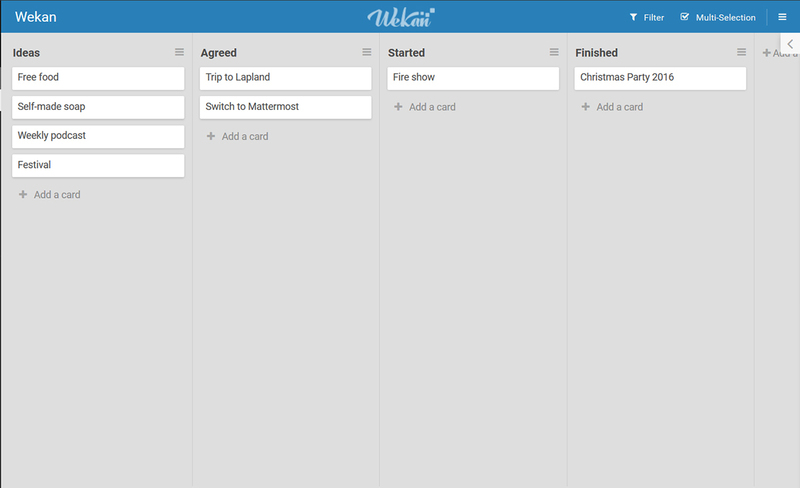 If you know Trello at all then WeKan will seem very familiar. If you don't know Trello then we will look at the benfits of kanban as an organising principle, and play with ways of using it. Secondly we will look at ways in which members can join in discussions from a distance. Oliver will join us from Tornio for the session, and we will try to take advantage of that to look at how we can best include him. This may mean trying out alternatives to Skype, but it may also mean looking closely at our behaviour, and what we need to modify to make sure that members at a distance can follow discussions and make meaningful contributions. The conventions we adopt may often turn out as important as the software we use. Please bring a mobile phone, tablet, and/or laptop. You will can get an account on our Mattermost server if you want to see the differences between Mattermost and Slack. You can also experiment directly with we see what it can and cannot do we will decide what to do next. No tickets needed. Everyone welcome!